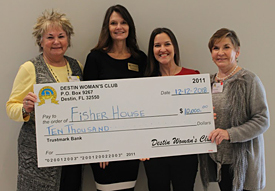 The Destin Woman's Club (DWC) is comprised of members who give of their time, personal contributions and volunteer for various fund raising events in order to support the needs of our local community. These activities benefit the various local charities the club supports such as, but not limited to, our long established Mary Kirkpatrick Assistance Fund, Fisher House of the Emerald Coast, Inc., project on Eglin Air Force Base, and The Carol & Bob Winsett Memorial Scholarship Fund. The DWC Assistance Fund, formally known as the Mary Kirkpatrick Assistance Fund, serves to aid and assist the needy in our area. This fund seeks to fill the gap between public assistance and self-sufficiency and strives to help in such a way that those in need may further help themselves. The DWC provides such help to needy families that includes grocery store/gas/department store gift certificates and/or gift cards and full or partial payment of rent, utilities, medical expenses or child care. Typically requests come from DWC members, local community organizations such as Harvest House and from local church organizations. The DWC Assistance Fund can also help provide food during such Holidays as Easter, Thanksgiving and Christmas to the needy in conjunction with other local charities. Donations from the Assistance Fund has also be used to help Fisher House and Shelter House. Click here for detailed overview and DWC contacts. Fisher House: In recognition of the special sacrifices of wounded or ill service members and their families, the Fisher House Foundation donates “comfort homes” so that families may face medical crisis together. Fisher House of the Emerald Coast is located on Eglin Air Force Base in Northwest Florida and provides a home away from home so that our military families can be together during treatment for serious illness or physical/occupation therapy. The House is within steps of the Eglin Air Force Base Hospital and Veteran’s Clinic. The Carol & Bob Winsett Memorial Scholarship: Since 1994, the DWC has provided a self-perpetuating scholarship fund at Florida State College. This enables single women to return to college, helping them provide a better future for themselves and their children. As of 2014, the Scholarship Fund was renamed The Carol & Bob Winsett Memorial Scholarship Fund, in honor of Carol Winsett. Carol was a dedicated Chair of this fund for many years until her passing in 2013. Specific requirements, as stipulated by the Florida State College, and upon approval of the DWC Executive Board, must be met per year by the scholarship recipient. The Destin Woman’s Club awards approximately $1,500 per year for each scholarship recipient. The Destin Woman's Club was formed in 1976 by a small group of women. It was known as the Lakeshore Woman's Club then but soon went through a name change to better identify with the community. Destin was a much smaller town and these women saw there were needs that weren't being met. If they could tap the private resources and funnel them towards community projects everyone would benefit. They also saw an opportunity to bring the people together for social event. This is how it started; a few good women came together with some good ideas and a desire to help others. Our luncheon meetings are what keep us connected. We meet on the second Wednesday of the month, September through June. This gives us a chance to keep up with each other as well as the business of the club. We enjoy some of the areas most interesting and entertaining speakers. Our program committee does a wonderful job of presenting informative people that keep us in touch with our community. We have had the privilege of hosting politicians, physicians, writers, artists, archaeologists, scholars as well as fashion shows and local entertainers. 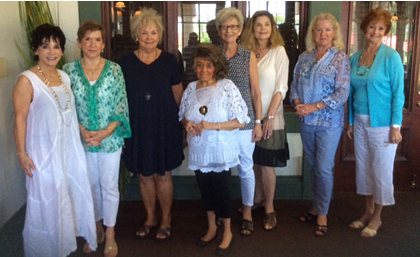 Our wonderful new 2018/2019 Board for DWC, (from left to right): Patti Burcham, Kate Callicott, Linda Hodges, Cindy Posey, Maggie Grogan, Sherry Sheldon, Helen Everett, Denise Dobelek and not pictured Carol Rementer. Copyright © 2006-2019 Destin Woman's Club. All rights reserved Site by VTD, Inc.